Ref. 2499 ?Cartier? Patek Philippe & Cie, Genève, No. 869360, case No. 2637701, Ref. 2499. Made in 1966, sold on April 29, 1968. Retailed by Cartier. 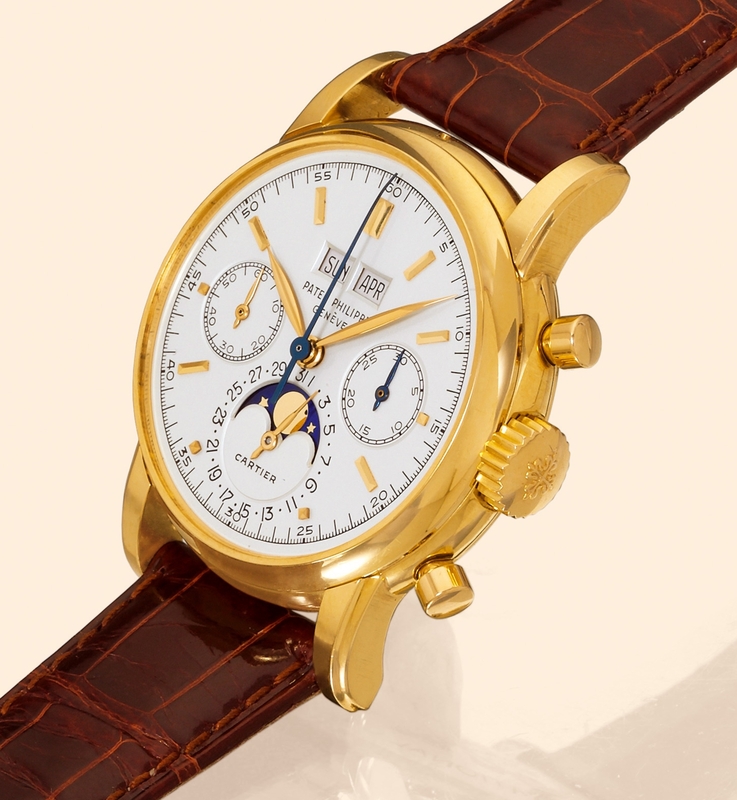 Extremely fine and unique, astronomic, 18K yellow gold gentleman?s wristwatch with round button chronograph, register, perpetual calendar, moon phases and an 18K yellow gold Patek Philippe buckle. Accompanied by the Extract from the Archives and a duplicate of Cartier certificate. C. Three-body, solid, polished and brushed, concave bezel, fluted curved lugs. D. Matte silver with applied yellow gold bâton and pyramidal indexes, subsidiary seconds and 30-minute register dials, graduation for the days of the month, outer 1/5th second scale, apertures for the days of the week, the months and the moon phases. Yellow gold "feuille" hands. M. Cal. 13''', stamped twice with the Seal of Geneva Quality Mark, rhodium plated, "fausses-côtes" decoration, 23 jewels, straight line lever escapement, monometallic balance, 8 adjustments, self-compensating Breguet balancespring, swan-neck micrometer regulator. Dial, case and movement signed. Diam. 37,5 mm. Height 13,5 mm. C. Three-body, solid, polished and brushed, concave bezel, fluted curved lugs. D. Matte silver with applied yellow gold bâton and pyramidal indexes, subsidiary seconds and 30-minute register dials, graduation for the days of the month, outer 1/5th second scale, apertures for the days of the week, the months and the moon phases. Yellow gold "feuille" hands. - First series: From 1951 to circa 1960, square buttons, "Feuille" hands, applied Arabic numerals, fluted lugs. - Second series: Square buttons, "Dauphine" hands, applied indexes, the 12 in Arabic numerals. - Fourth series: From 1978 to circa 1985, becomes Ref. 2499/100, round buttons, sapphire crystal, "Dauphine hands", applied "Bâton" indexes. Very few examples were made with tachometer or telemeter scale and three pieces only with sapphire crystal back. For this series, models with the tachometer indication are extremely rare. Similar watches are published in "Patek Philippe Wristwatches", by Martin Huber and Alan Banbery, 1998, page 304, 302 and in "Collecting Patek Philippe Watches" by M. and O. Patrizzi, Guido Mondani Editore, Genova, 2000, p. 296, pl . 476A. This watch was previously sold by Antiquorum, Geneva, ?The Art of Cartier?, November 1996, lot 566. To our knowledge, this is the only example of a Ref. 2499/100 wristwatch bearing the Cartier signature that has apppeared at auction.